Cardiovascular disease is the leading cause of death for both men and women. About 610,000 Americans die from heart disease each year – that’s 1 in every 4 deaths. Furthermore, cardiovascular disease is the leading cause of death for people of most ethnic and racial groups. As a category, cardiovascular disease includes coronary artery disease (CAD), cerebro-vascular disease (stroke), hypertension (HTN) and peripheral arterial disease (PAD). In most cases, the underlying pathologic condition is atherosclerosis. Atherosclerosis is synonymous with arteriosclerosis and ‘hardening of the arteries’. 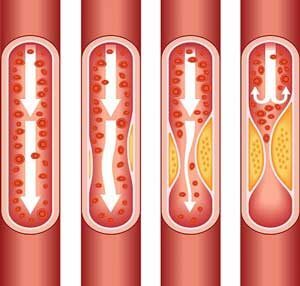 This is a complex process where the blood vessel wall becomes inflamed and over time cholesterol plaques can form which leads to blockage or narrowing of the artery. When the blockage results in decreased blood flow to an organ, damage can occur. In the case of loss of blood flow in a coronary artery feeding the heart, the result is heart attack. As plaque builds up in the artery of a person with heart disease, the inside of the artery narrows which leads to reduced blood flow over time. During 2008-2010, death rates due to heart disease were highest in the South and lowest in the West. 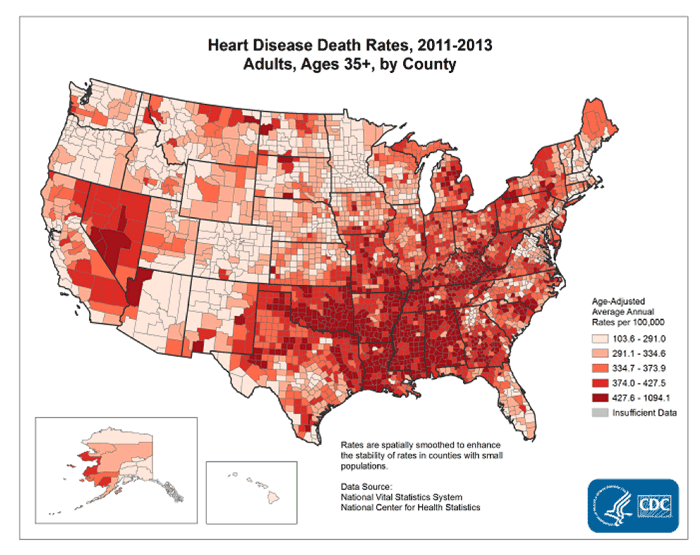 Below is a map showing the prevalence of heart disease across the United States.